(CBS/AP) Until now, Harry Potter fans could only imagine the sensation of quaffing a butterbeer, finding a magic wand at Ollivander's or escaping the steam from a snarling dragon's snout. But finally, 13 years after the first of seven books began chronicling the boy wizard's adventures, imagination has become reality at Universal Orlando. The Wizarding World of Harry Potter, a minipark inside Universal's Islands of Adventure theme park, opens to the public on Friday, one of most highly anticipated theme-park attractions in years. The park received a vague, unspecific bomb threat Thursday night, Universal spokesman Tom Schroder said, and is working closely with law enforcement officials and taking all "appropriate precautions." According to the Orlando Sentinel, authorities were investigating the call, but police said it wasn't practical to search the park's entire grounds. A message left for a police spokeswoman was not immediately returned. But the police activity did not deter large crowds from flooding the theme park Friday morning. Visitors will get their first glance at 9 a.m., but the parking garages at Universal opened at 5 a.m. for eager muggles to begin lining up, reports CBS affiliate WKMG in Orlando. Journalists and a few lucky visitors have already gotten a sneak peak at the park. Past a stone archway and the steam-belching Hogwarts Express, the fictitious city of Hogsmeade unfolds amid snowcapped, dingy rooftops and storefronts packed like row houses with shops straight from the books and movies. Zonko's joke shop offers Sneakoscopes and extendable ears. The confectionary Honeydukes has chocolate frogs and Bertie Bott's Every-Flavour Beans (literally ranging from pear to fish). At the Owl Post, guests can stamp mail with a genuine Hogsmeade postmark. Towering over it all is Hogwarts, a perfect reproduction of the imposing, many-spired castle where Harry and his magician friends are students. "Once we locked in and knew what we were doing, what we thought would be the most iconographic moments of the fiction to bring to life, it became a matter of executing at a level of authenticity and detail that was going to be unquestionable," said Mark Woodbury, head of Universal Creative. "It was crowded, but great. Definitely well worth the wait. Everything is small, but when you're inside it makes you feel attended to," said Jennifer Moore, a one of the early visitors. Park construction was overseen by the production manager from the Potter movies, and as Warner Bros. filmed the series' sixth movie, "Harry Potter and the Half-Blood Prince," scenes were shot for the park's crown jewel, a ride called Harry Potter and the Forbidden Journey. The cutting-edge ride seamlessly combines the sensation of flight with tactile experiences like smoke and drops of water as it takes guests through a hodgepodge of encounters in Potter's chaotic life, from the Quidditch field to the mouths of giant spiders and dragons. The ride queue stars lifelike projections of film characters like Hogwarts headmaster Albus Dumbledore. "The special effects were just great! You really felt like you were riding along with Harry on his adventure," said visitor Karen Collins of Revere, Massachusetts. The average time to experience the new Forbidden Journey ride is about one hour, according to Universal, but with more people, the wait time will be longer. Potter author J.K. Rowling is a stickler for details, and Universal worked hard to get her approval. So many recipes were offered to find the perfect look, texture and taste for the heretofore fictitious butterbeer that Woodbury lost count. "We had to package up all the ingredients and rent a hotel kitchen in Scotland so that we could put it all together," he said. The result? A tasty, thickheaded (and nonalcoholic) brew reminiscent of cream soda, which has proven wildly popular with the fans who bought special tickets to preview the Potter park ahead of the June 18 public opening. Like Wizarding World employees, some of these avid Potterphiles dressed in robes and wizard hats, at times giving the place the slightly geeky feel of a "Star Wars" convention. Besides the Forbidden Journey, The Wizarding World has just two other rides: Flight of the Hippogriff and Dragon Challenge, both of which are older roller coasters repurposed with Potter themes. There's no additional admission for Wizarding World once you pay to enter Islands of Adventure. But guests who travel long distances to see it may be disappointed that there is not much to do beyond the three rides other than soaking up the scenery and going shopping - although long lines for the attractions could easily keep them in the minipark for hours. One-day tickets can be purchased online for $69 for kids and $79 for adults. Universal reportedly spent $200 million to create the world, and it's hoping the investment pays off. According to theme park attendance numbers, in 2009, Universal Orlando ranked 13th in the world, but the park is hoping that number will change for the better. The attraction's lure could rival the economic impact that Disney's Magic Kingdom had on central Florida nearly 40 years ago, according to a University of Central Florida theme parks expert told WKMG. Duncan Dickson, an assistant professor at UCF's Rosen College of Hospitality Management, said "Wizarding World" will give Harry Potter fans a reason to visit Florida, providing a much-needed boost to Orlando-area hotels, restaurants and stores. "Right now, it's just a small part of Islands of Adventure. They could grow this thing into huge proportions," Dickson said. Florida's tourism industry is currently struggling because of the economy and the Gulf oil spill. "This has the potential to have as big of an impact as the Magic Kingdom in 1971," Dickson said. "It gives people a reason to travel and experience something different." The shopping opportunities are so extensive - from broomsticks ($250 to $300) to magic wands ($28.95) and Gryffindor scarves ($34.95) - that it feels at times like the whole park is for sale. The Wizarding World is an ambitious bet for Universal, which is co-owned by a division of NBC Universal and private equity firm Blackstone. Contract details buried in Securities and Exchange Commission filings reveal how badly Universal wanted a piece of the franchise, which it describes as the most financially successful in film history. The contract gives Universal the rights to operate the park for nine years, with two additional five-year options. But the rights can be pulled should Universal fail to maintain minimum quality standards, invest enough capital or sell its controlling interest. Universal has poured cash into the park the past few years, sinking up to $380 million in the Potter park and two other attractions - a ride themed on television's "The Simpsons" and a roller coaster on which guests choose their own soundtrack. 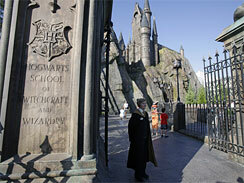 The Potter section of Islands of Adventure alone reportedly cost more than $250 million. Twitter was filled this week with rave reviews of what was being referred to in tweets as "wwohp." One fan who got access to the soft opening said it was the "best park experience" he had had in a long time; another said Forbidden Journey was so good she cried. 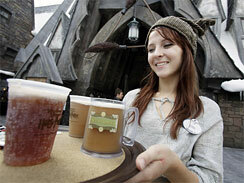 "Thumbs up" to butterbeer and pumpkin juice, tweeted another. "It was truly amazing; they brought the books to life," said Jacki Lenners of Flagstaff, Arizona, who attended an early preview of the park last month. "Wizarding World" held a star-studded opening ceremony Wednesday night, complete with J.K. Rowling and the cast of the movies. Daniel Radcliffe, the actor who plays Harry Potter, lit up Hogwarts with a flick of his wand and reciting of a spell before a fireworks show illuminated the castle.